Today I am thankful for passion. Passion is defined as “a strong or extravagant fondness, enthusiasm, or desire for anything.” Most people tend to solely associate the word “passion” and the idea of being passionate with amorous relationships, but it is so much more than that. 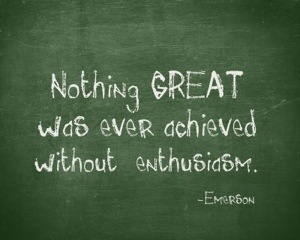 Passion is a necessary and key element for having successful relationships, employment, and an overall successful life. Passion is the difference between doing something because you need to and doing something because your inner being compels you to do so. It is a way of life, not a temporary state of being. Passion is that “big” little something inside of you that motivates you to faithfully continue to do something that is challenging when most other people would throw in the towel if they were in your shoes. Passion is what separates champions from competitors, committed couples from those who hop from person to person, and doers from those who only think. It is because of passion that those who are fueled by it will not settle for anything less than giving their best and receiving the best from others, the world, and this life.